Size of bird eggs varies roughly according to the size of the adult bird. The ostrich lays a 1.5 kg egg (right). The other eggs shown are from a chicken (lower left) and quail (top left). An egg results from fertilization of an ovum. The egg is a container for the zygote. It protects the zygote, and feeds the embryo. The animal embryo develops until it can survive on its own, at which point the egg hatches. Most vertebrates, arthropods and molluscs lay eggs outside the mother's body. They are always in some kind of container, a shell or covering. Reptiles, birds and monotremes lay cleidoic eggs: bird eggs are an example. These are a special kind of egg with a good supply of food and water. They have an outside covering which lets through gases so that carbon dioxide can get out, and oxygen can get in. Fish, amphibia, insects and arachnids lay simpler eggs in greater numbers, but with much less protection and nourishment. Some animals, mostly mammals, keep the zygote inside their body where the embryo grows until it is ready to be born. These are also cleidoic eggs, but all the development is done inside the mother's body, as with humans. Most mammals, and a number of marine reptiles, give live birth. Also, there are some invertebrates, such as scorpions, where the eggs develops inside the mother. They also give birth to live young. The ostrich has the largest eggs of all living animals. Eggs, mostly bird eggs, are often eaten as food. The shell of an egg is a hard calcareous (CaCO3) material. The shell of an ostrich egg can support the weight of a fully grown human. 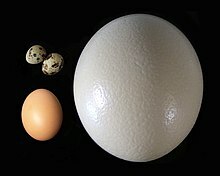 Wikimedia Commons has media related to Eggs. This page was last changed on 28 January 2016, at 02:32.